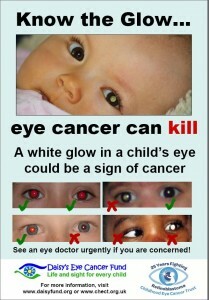 Retinoblastoma usually develops over time. As the cancer cells grow within the retina, they spread more deeply into the eye and can spread to surrounding areas. If retinoblastoma spreads (metastasizes) outside the eye, cancer cells are often found in tissues around the eye, or it may spread to the central nervous system (brain and spinal cord) or to other parts of the body. The pupil of the eye appears white instead of red when light shines into it (known as “cat’s eye reflex” or “white eye”). This may be seen in flash photographs of the patient. 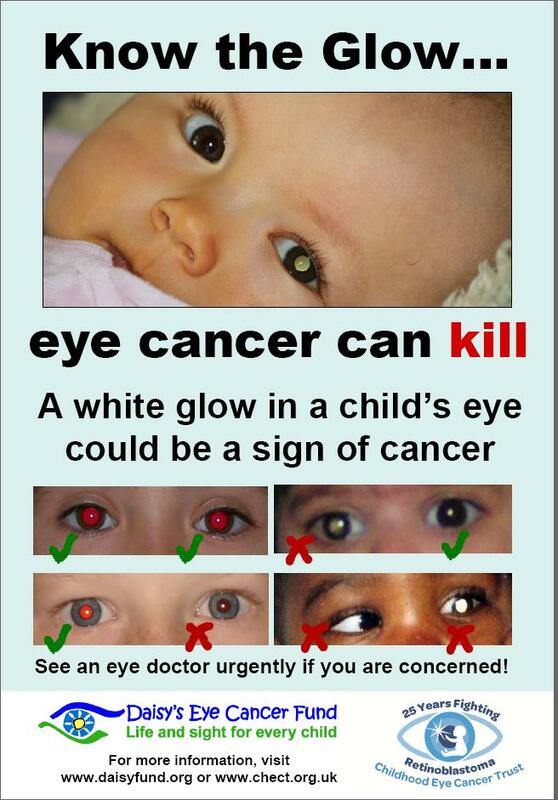 Many thanks to Daisy’s eye cancer fund and Children’s Eye Cancer Trust (CHECT) for allowing us to use their image.